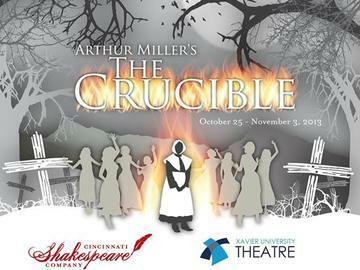 I saw “The Crucible” tonight featuring members of the Cincinnati Shakespeare Company and Xavier University students. It is extremely well done and if you’re a fan of the show or if you have never seen it (and everyone should, it is a classic after all) then you should try to. Tickets for the 11/3 final performance are available here. I’ll have more to say about it in Monday’s blog, but I highly recommend it.